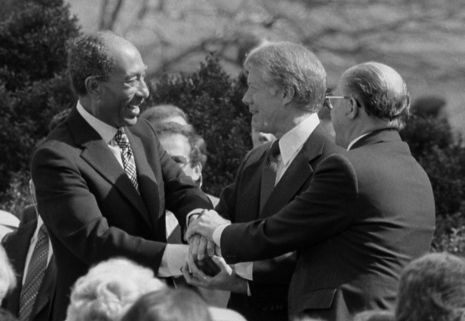 The 1979 Egypt–Israel Peace Treaty was signed in Washington, DC, United States, on March 26, 1979, following the 1978 Camp David Accords. 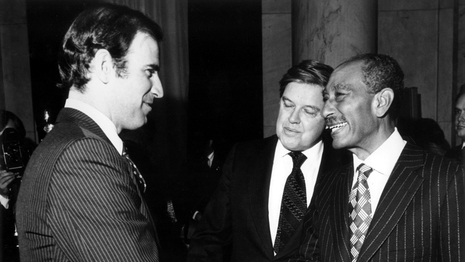 The main features of the treaty were the mutual recognition of each country by the other, the cessation of the state of war that had existed since the 1948 Arab-Israeli War, and the complete withdrawal by Israel of its armed forces and civilians from the rest of the Sinai Peninsula which Israel had captured during the 1967 Six-Day War. The agreement also provided for the free passage of Israeli ships through the Suez Canal and recognition of the Strait of Tiran, the Gulf of Aqaba and the taba - rafah straights as international waterways.